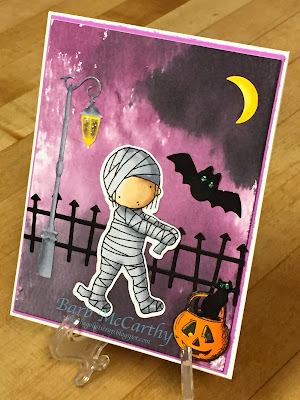 I am having so much fun with this cute little Mummy, my free (with a $60 order) Lamp Post and the Spooky Scene Die-Namics! I ink-smooshed the background and used the pumpkin from Stampers Anonymous "Crazy Things" set. At this rate I will have my Halloween cards finished quite early! I love the ink smoothed background: super spooky! I love the ink smooshed background: super spooky! Wow, I love your night sky! Very spooky!